Dormitory style and range in size and offer mixed accommodation. 3, 4, 6 and 8 bed dorm rooms with a mix of single and bunk beds. 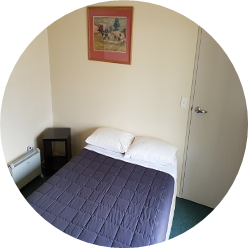 Double and twin rooms with 1 double bed or 2 single beds. Heating provided by radiator. Shared bathrooms, kitchen and common areas! 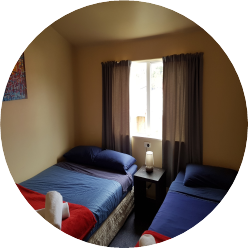 Ensuite double and twin rooms with private bathroom. Heating supplied with access to shared kitchen and common areas. 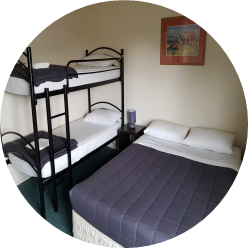 Ensuite family rooms with Queen bed and single/bunk beds depending on size. They have their own private bathroom. 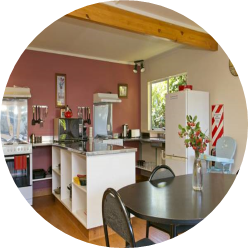 Spacious and well stocked kitchens are just a few of our great facilities. Fridges, ovens, cook tops and all the pots and pans you need. You just can't kick back and relax in the mountains without a roaring fire. What a way to end the day! How about a movie and a cozy fire? 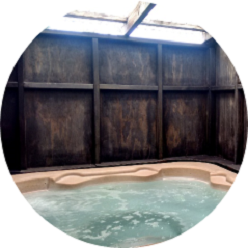 What could be better than soaking in our nice warm hot tub after a day hiking or skiing? Our hot tub is ALWAYS on! National Park Village is located at the intersection of State Highway No. 4 and State Highway No. 47 on the volcanic Plateau. 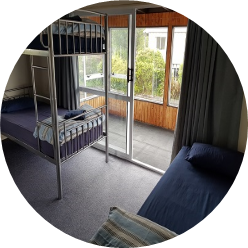 Howard’s Lodge is ideally positioned, close to Tongariro National Park, Whakapapa and Turoa Skifields and the Whanganui National Park in the Central North Island. 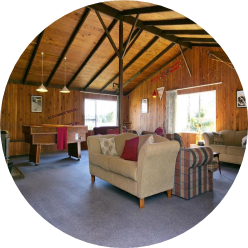 Our private lodge gives your group the freedom to come and go without having to worry about other guests. As well as it own kitchen and lounge, it boasts a wood burning fireplace for those cold winter nights. Book this unit for your groups! Click HERE for our contact page for more details! Our kitchens can cater for small or large groups. For larger groups, we can even dedicate you your own kitchen facilities. Click HERE for our contact page for more details! Our 2 spacious lounges offer more than just a sofa. Feel like a movie or a game of pool? How about a game or just a relaxing place to curl up with a book? Click HERE for our contact page for more details! Not many places can boast a relaxing hot tub available anytime day or night. If your bones and muscles are aching after a day of hiking or skiing, kick off the clothes and go for a soothing dip! Click HERE for our contact page for more details! Are you looking for long or short term work? Interested in tourism in New Zealand? Do you enjoy people and promoting your community? Howards Lodge may be what you are looking for! We offer a friendly enjoyable work environment which could include accommodation. Click HERE for our contact page and to express interest!